As part of the revisions to the plans for the church following the death of Pope Innocent X, the decision was made to dedicate a chapel to Saint Agnes, rather than the main alter, with the chapel being placed closer to the site of her martyrdom. Here, within a series of false perspectives, we see the statue of the church’s name saint. Although the sculpture was executed by Ercole Ferretti, the form and expression are based on drawings by Bernini. 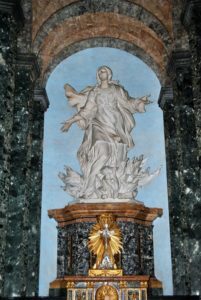 The splendid stuccos decorating the chapel are by Paolo Landini. Landini participated in the interior works from 1662 to 1664, together with Giovanni Battista Ferrabosco and Giovanni Francesco Rosi. The chapel walls are enriched with two pairs of oval medallions in alabaster, showing relief busts against black backgrounds: these are probably portraits of popes or saints with a particular affection for Saint Agnes.